Taken in by a carpenter named Joseph and his wife Gabriella and taught the crafts of woodworking and carving, he meets a beautiful, caring girl named Mary who teaches him how to find love and inspires him to believe in his dreams. Kris uses his art to make ingenious toys, which he loads on his sleigh and anonymously delivers to the adopted homes of his brothers and sisters each year on the night before Christmas. But of all his deliveries, there is one which may never reach the person for whom it was made. “Kris” chronicles the journey of a young man who despite his very human weaknesses grows to become a worldwide symbol of kindness and generosity, as Santa. The story’s roots lie in the historical facts, customs, and beauty surrounding the traditions and timeless spirit of the Christmas season. 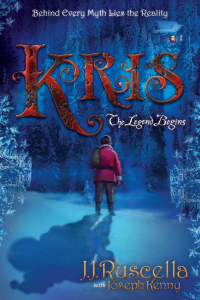 “Kris, The Legend Begins” – Set in the Laplands of the early 1700’s, Kris follows one young man’s inspirational journey, born from heart-breaking circumstances, to tell the joyous story of how he grows to become a universal symbol of goodness, instilling hope and wonder in children and adults alike world-wide, (i.e. Santa Claus). Set against the rich tapestry of Norway, with snow covered mountains, the Sami natives and deep character development, the tale of Santa’s origins will captivate you from page one. Kris’ heroic efforts continue throughout, until life itself challenges & inspires him. Transforming him into the legend we now know as Santa.